Decisions, decisions... Do you want hot 'n crunchy jalapeño poppers or sweet 'n savory barbeque chicken? No need to choose! 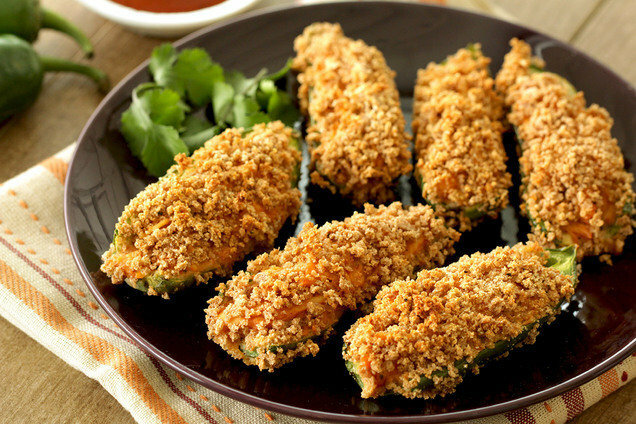 These poppers are stuffed with a creamy BBQ chicken filling, and they're as delicious as they are low in calories and easy to make. Score! Pound chicken to 1/2-inch thickness. Season with 1/4 tsp. garlic powder, 1/4 tsp. onion powder, 1/8 tsp. salt, and a dash of black pepper. Place on the center of the foil. Bake for 25 minutes, or until chicken is cooked through. In a wide bowl, combine breadcrumbs and remaining 1/2 tsp. garlic powder, 1/2 tsp. onion powder, and 1/8 tsp. each salt and black pepper. Mix well. Place egg whites/substitute in a second wide bowl. Cut packet to release hot steam before opening entirely. Leave oven on. Transfer chicken to a medium-large bowl. Shred with two forks. Add cream cheese and BBQ sauce to the chicken. Mix thoroughly. Evenly spoon and spread chicken mixture into the pepper halves. One at a time, coat pepper halves with egg whites, shake to remove excess, and coat with seasoned crumbs. Remove foil from baking sheet, and spray with nonstick spray. Place stuffed peppers on the baking sheet, stuffed sides up. Top with any remaining seasoned crumbs. Bake until outsides are crispy and peppers have softened, 25 - 30 minutes. Hungry for More Healthy Swaps for Bar Bites? March 7th (today) is National Cereal Day! Sure, you could enjoy a classic cereal bowl with milk, but we're big fans of this crunchy fruit 'n yogurt spin! This recipe screams party, so get it started! Click "Send to a Friend" now to pass it on.